You mean Algonquian. Algonquin is a language variety very closely related to Ojibwe. I meant to say, Algonquin is actually spoken in Ontario as well. Not sure about Toronto, though. Pretty sure Ojibwe's still relatively strong in the Toronto area. And I was speaking generally about Ontario. So Algonquin and Algonquian are two different things?! Talk about confusing! 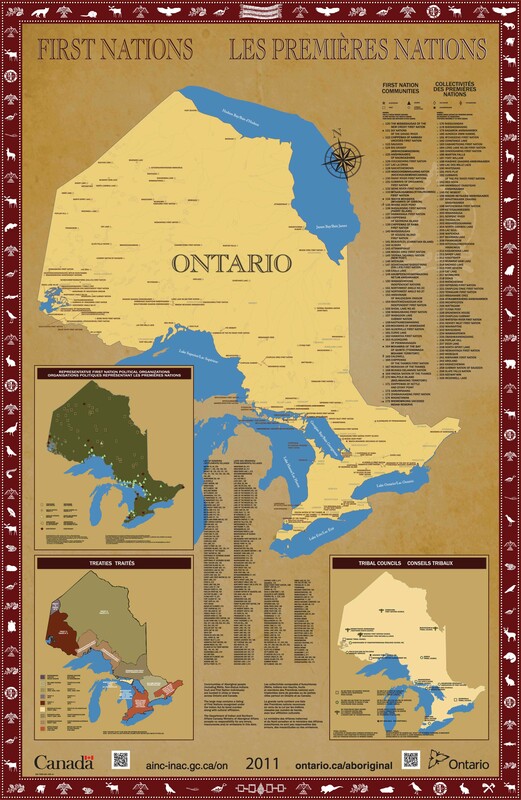 I did try to look up the native tribes native to Barrie, Ontario (the city where I now live; it's about 1-1.5 hours north-west of Toronto), and did find an Ontario First Nations map. But I find that map not helpful as it lists what I believe are reserves and reserve names, rather than a breakdown by tribe. I also found this, which lists 2 organizations in Barrie. I contacted one of them, the Barrie Area Native Advisory Council, to ask about either Ojibwe classes in the area or other Native Canadian language classes. dEhiN wrote: So Algonquin and Algonquian are two different things?! Talk about confusing! Ethnologue seems to suggest that the language spoken closest to Barrie is Ottawa a.k.a. Odawa, which is a variety of Ojibwe. Other Algonquian languages spoken a little closer to the US border are Potawatomi, which is closely related to Ojibwe, and Munsee, which is more closely related to Lnuismk (Micmac) and was originally spoken on the other side of the border. In the other direction, closer to Lake Erie, there are Iroquoian languages spoken, namely Cayuga, Mohawk, Oneida, Onondaga, and Tuscarora, of which Oneida is the one that's spoken closest to Barrie. Last edited by vijayjohn on 2018-10-08, 16:40, edited 2 times in total. Or, closer to home, "Sioux" vs "Siouan". vijayjohn wrote: Ethnologue seems to suggest that the language spoken closest to Barrie is Ottawa a.k.a. Odawa, which is a variety of Ojibwe. Other Algonquian languages spoken a little closer to the US border are Potawatomi, which is closely related to Ojibwe, and Munsee, which is more closely related to Lnuismk (Micmac) and was originally spoken on the other side of the border. In the other direction, closer to Lake Erie, there are Iroquoian languages spoken, namely Cayuga, Mohawk, Oneida, Onondaga, and Tuscarora, of which Oneida is the one that's spoken closest to Barrie. I'm not so sure about Ottawa being the language spoken closest to Barrie. I've attached a Google Maps picture of Barrie in relation to Lake Huron, Toronto, Lake Ontario, etc. and if I compare it to the Ethnologue map, it seems like Barrie falls on a dark, dotted line in the Ethnologue map. Meaning that there's no language that's shown, and the closest (to me) seem to be Eastern Ojibwe. Edit: I actually drafted this post up yesterday, but didn't get a chance to finish it. vijayjohn wrote: How's Tamil going, dEhiN? I might as well do an update since that'll also answer how Tamil's going. So as you can see, I didn't do Exercise 4 (I'm sorry Vijay ). I did add some vocabulary to Anki. To be honest, I don't recall why I wasn't able to do much. - Ok, well what about Ojibwe? - Ok, but what about the fact that we dropped Swedish and Korean (and then prior to that, Albanian, Welsh, Irish, and Tagalog)? Would it make more sense to try and do Swedish or Korean again before adding two new(ish) languages? It's not really being fair to these other languages to now take up two others. So, basically I'm somewhat torn between studying two languages that I'm currently interested in, or going back to one (or more) language(s) that I am no longer interested in. The answer seems obvious, but I guess it's more that I'm concerned about never finishing what I start - that by doing new languages, I'm perpetuating a habit of starting something and then dropping it when I get bored with it, only to start something new, etc. *Do you use "last night" or "yesterday night"? I've always been used to "yesterday night" and that's my default. But I remember my girlfriend remarking once a few months into our relationship how I use that a lot and she's used to "last night". She also felt that almost all the English speakers she's known have used "last night" and so found it a bit of an anomaly to hear "yesterday night" so much from me. I've since tried to take note and I think she's correct: it seems that among my circles, most of the people I know use "last night" with the exception of myself and perhaps my family. **Yes, my internal dialogue refers to myself as "we"! It's a Disgaea 1 reference. I wasn't expecting you to get it. As you can see, I don't have anything major planned for Spanish and Portuguese. I'm not sure if I'll be able to actively go through all 6 languages, so I think I'll just maintain Spanish and Portuguese. I'll also add any new words I come across to Anki, and work on learning fully the preterite verb conjugation for regular verbs and several irregular ones. One thing holding me back in these two languages is a lack of knowledge of verb conjugations apart from the present indicative tense. This has been the case for a while, and it's time to remedy that. For Sumerian, I'm going to take a page out of Luís book and go through a page at a time. I feel that this approach will help keep me motivated and not start to feel like going through IGS is a chore. Vijay, if you (or anyone else reading this) wants to go through IGS with me, we could do a study group! I still think even in that case, taking it a couple of pages a time instead of one lesson or half a lesson will be easier. For Tamil, I'm thinking of switching from TLIC to Thamizh Paadanool because I feel like at this point, focusing attention on a more grammar-based approach will be helpful for me. I think I have a good enough small base of nouns, pronouns, verb roots, and case as well as other suffixes, that a structured grammar approach will better help me to put it all together. I also want to go through those books my parents got me in Sri Lanka; I just need to find time to scan the books in. If I find going through both Thamizh Paadanool and the books too much, I might just focus on Thamizh Paadanool, and worry about building up some more my vocabulary base afterward. For French, I've always wanted to be able to read the AA text in French, ever since I found out I could get the text in other languages. (One of my dreams it to one day be able to read fully the text in the 4 main languages I study). I have had the French version of the text for a couple of years now, but the few times I've tried to go through it, I quickly get stumped. The two difficulties I run into are new vocabulary which impedes my understanding of a sentence or paragraph, or being able to hold onto what I've already read to fully understand a paragraph. What I mean by that is, even if the paragraph has no new vocabulary, by the third or fourth sentence in, I've lost the point of what I'm reading. If I end up actually going through the whole text, and using my TAC to post it all one paragraph at a time along with my translations (to show my understanding), technically someone could put it all together. But I don't think there would be any copyright or otherwise issues with that...at least, I hope not! Okay, I'm willing to try to go through தமிழ் பாடநூல் and IGS at least with you (of course I'll try out a Sumerian study group!). Do you still want to do a French study group as well? A Sumerian study group is very tempting, I'll say. I don't know if I have the time for it though. What kind of work load would we be looking at? He said "a page at a time," so I guess one page per week? If that's the case, I can handle that.